The medals are slightly oval in shape. The Obverse, shown here in a striking orange patina, can be seen in the Chrysler Museum of Norfork, Virginia. 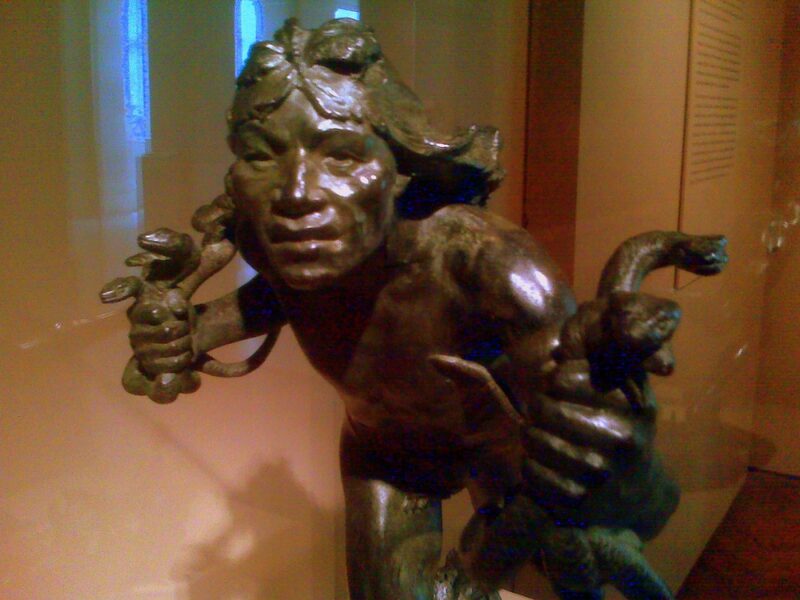 In his design Hermon MacNeil, has recaptured his 1895 image of the Moqui Runner. The title, PRAYER FOR RAIN, portrays a group of young Hopis sprinting to the right; their hands filled with snakes. 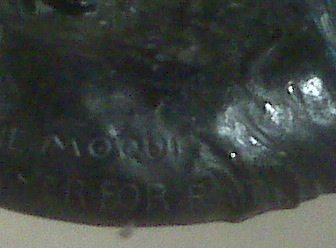 The Reverse side, shown in beautiful sea green patina, bears the title, “HOPI,” a more modern transliteration of “Moqui”. It shows a group of Hopi Indian dancers handling ritualistic snakes. It is owned by our webmaster. 1931 #3. HERMON MacNEILL. Hopi Indian Prayer for Rain. Obv Five Hopi rain dancers, two with snakes in their mouths, one crouching to gather up snakes for return to the cottonwood enclosure set up for the ceremony. Two other dancers distract mouth-held snakes with eagle feathers. MacNeil’s sky is adapted from Hopi sand painting showing stylized rain clouds and serpentine arrows of falling rain. Incuse HOPI in exergue. Signature H A MACNEIL incuse lower r.
Rev Dancers race from mesa onto the desert, hands full of snakes to be returned to their dens. Lightning flashes above, incuse PRAYER (vertical) FOR RAIN in exergue. MacNeil described the setting as the Kiva, An underground chamber. Members of the Snake and Antelope clans gathered snakes for six days from the compass points, above and below, “therefore from all the directions of the universe.” Poisonous snakes are included in the dance, distracted from the dancers holding them in their mouths by another dancer wielding an eagle feather. The artist witnessed several snakebites, which had no apparent effect on the exalted, fasting dancers. 1. THE SOCIETY OF MEDALISTS THIRD ISSUE. Rounded rims. Light tan, sea green highlights. A. 2. Ditto. Light tan with hints of gold. A. 3. Ditto. Intense glossy hematite red. A. 4. Ditto. Bold sea-green, sharply squared rims. A. Artist's rendition of the NEW Security system for Lincoln bust! Looks rather flimsy from here. The anonymous culprit ‘claims’ to be a member of a group of ‘supposed’ pre-professionals who eventually formed themselves into the notorious Statue Liberation Society (hereafter the ‘S.L.S.’). This student, now an alumnus, garbles on for 7 minutes and 22 seconds [ in a disguised voice] about a harmless prank that resulted in the kidnapping of the 16th President from his prominent perch in the circular stairwell of Lincoln Hall. That the Statue Liberation Society (S.L.S.) anonymously raise a challenge-reparation of $50,000 to be contributed to the existing ‘Lincoln Hall Scholarship Fund’. That these donations be met and exceeded by matching gifts from the faculty, staff, alumni and students of U of I. That the S.L.S. then be invited to shed their cloak of anonymity in a true ‘Lincoln-Douglas’ style of honesty. And that a spirit of ‘New Beginning’ be initiated by all parties with a rub of Lincoln’s refurbished nose in his new perch at the dedication of the new Lincoln Hall. Good Clean Fun for the next student generation! History books record it. ~~~ Public records document it. ~~~ But have you ever seen it? 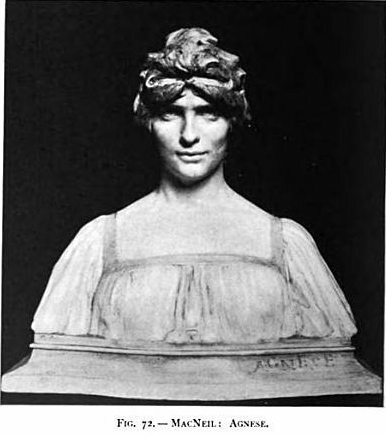 Hermon MacNeils bust titled “Agnese” as pictured in Lorado Taft’s “History of American Sculpture” in 1904. 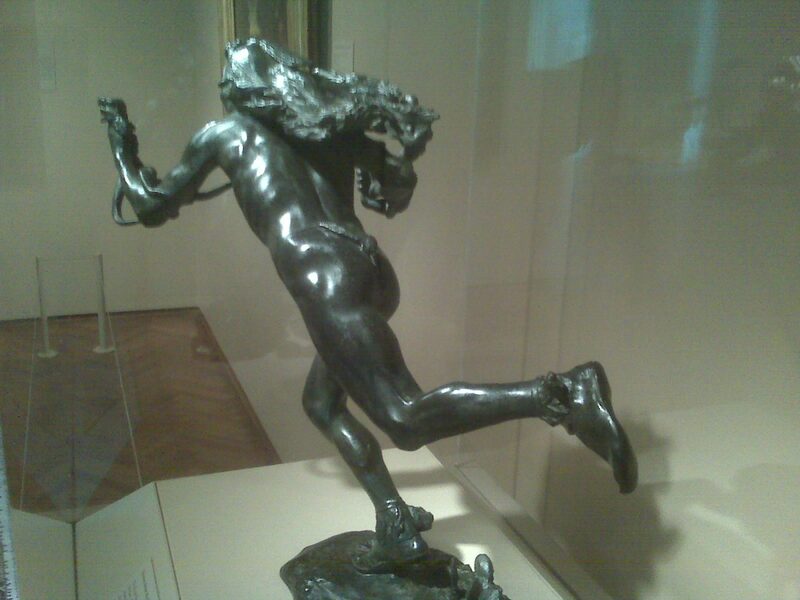 This sculpture appears“Mysterious” in many ways. the letters “AGNESE” on the corner of the base offer the only identity, yet itself a still a mystery. What is the composition of this statue? Marble? Paster? Other? Why can we find no other pictures of this piece? Was there only an Original “Agnese” and no other copies? What was the fate of this statue? Is “Agnese” in private hands? Other than that, I have NO questions! 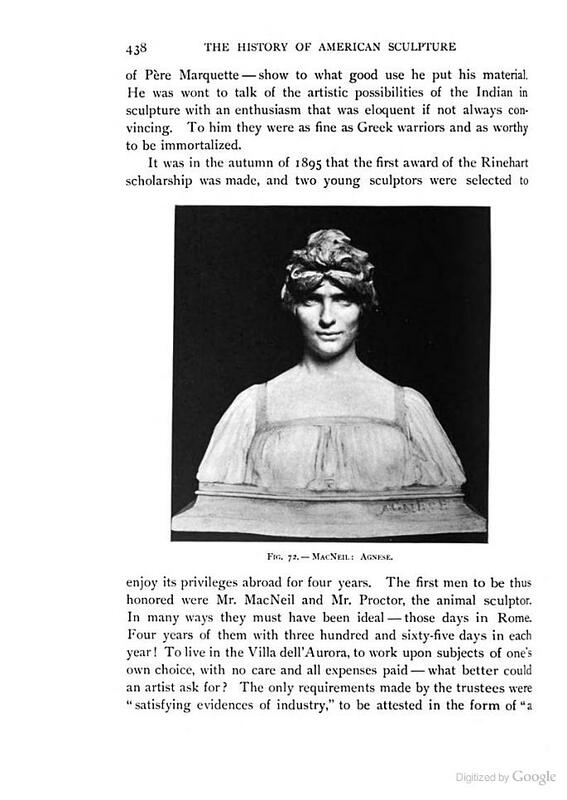 Sculptures that Hermon A. MacNeil’s exhibited for the 1901 Pan-American Exposition in Buffalo, New York. 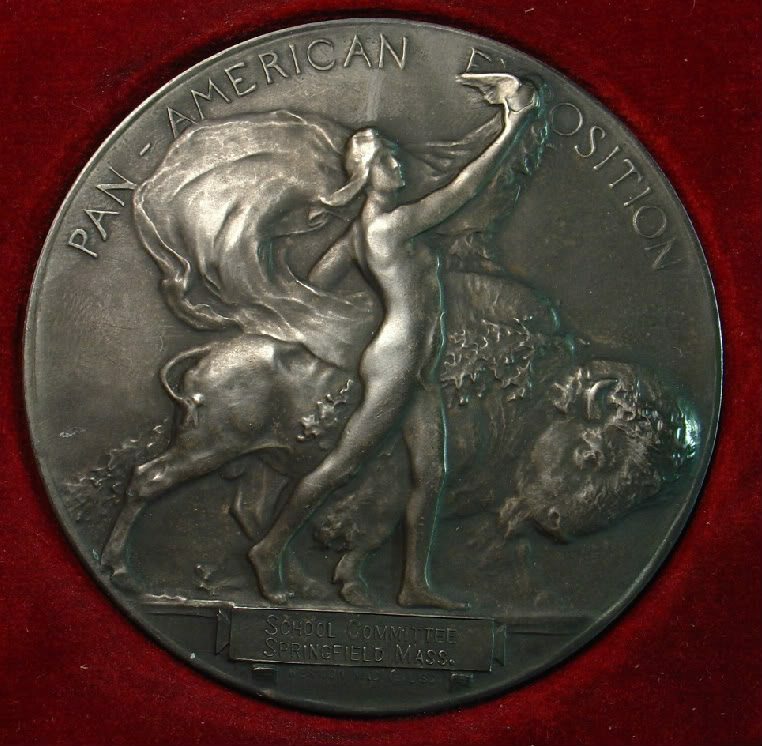 “The Catalogue of the Exhibition of Fine Arts.” Pan-American Exposition: Buffalo, 1901. (p. 45-46; p. 59). #1613. 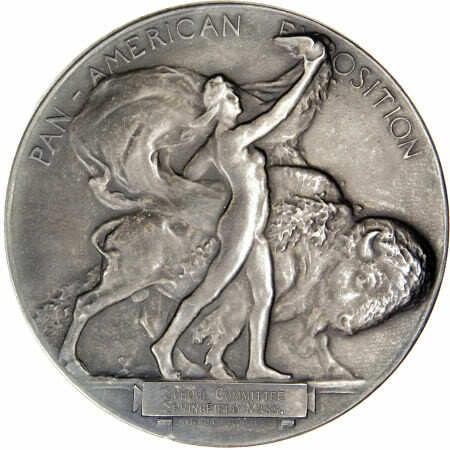 The Sun Vow – Silver Medal, Paris Exposition, 1900. 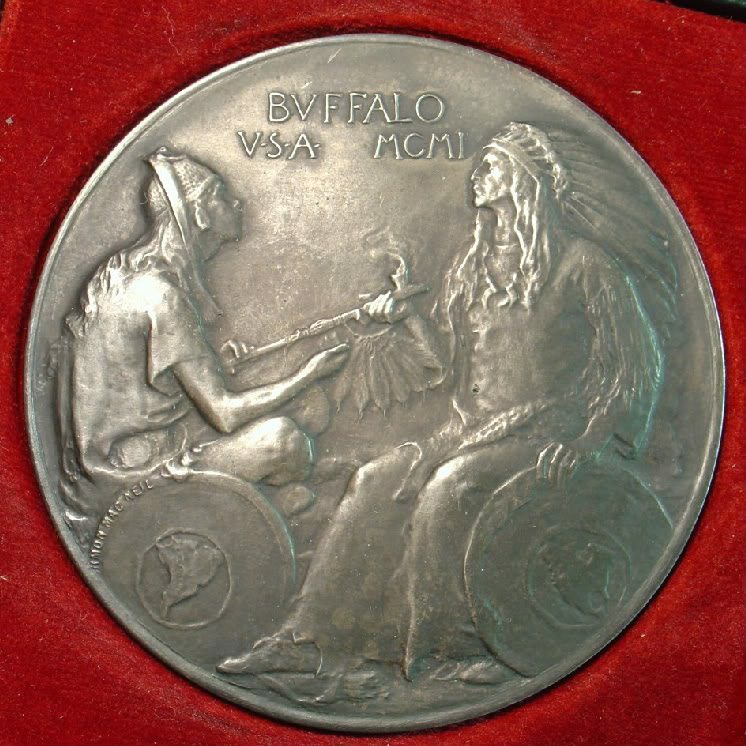 *II – indicates MacNeil exhibited in “Group II – Sculpture, including medals and cameos” p. 49. Some of these people mentioned in that exhibition record were to be long term colleagues, friends and patrons of MacNeil’s art and career. Charles Francis Browne was a painter and friend who accompanied Hermon MacNeil and author, Hamlin Garland, to the southwest in the summer of 1895. 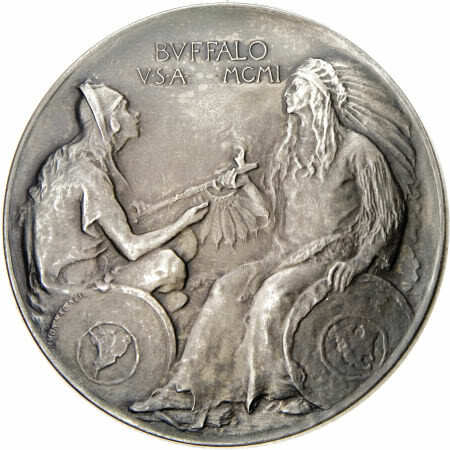 They wanted to gain direct experience of American Indians to inform their art. 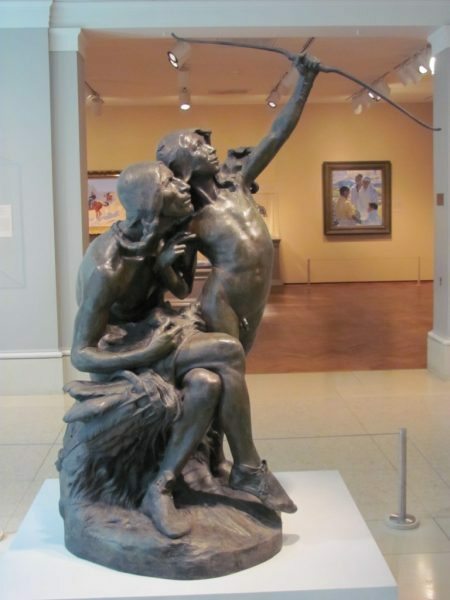 What the trio found reflected in their respective painting, sculpture and writing. 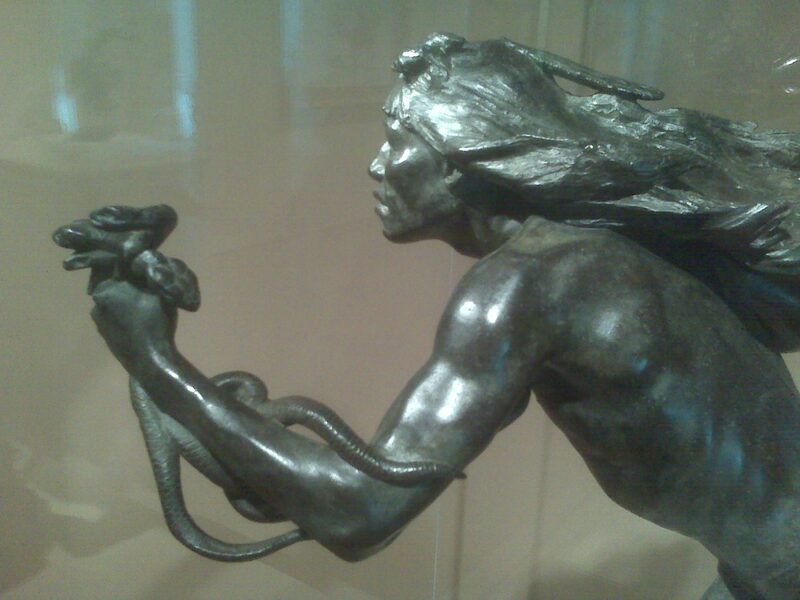 MacNeil’s subsequent sculptures of Native Americans after that summer of 1895 continued a cultural focus that began with his friendship and sculpting of Black Pipe, the Sioux warrior. He first met Black Pipe at the Buffalo Bill Wild West Show at the Chicago World’s Fair in 1893. The Sioux modeled for MacNeil and later worked in his studio for over a year. Edward Everett Ayers was an art patron to both MacNeil and Browne. He had been a Civil War Calvary officer stationed in the southwestern United States. He became a lumberman who made a fortune selling railroad ties and telephone poles. He urged MacNeil to travel to see the vanishing West of the American Indian. He became an arts benefactor whose art collections are now housed by the Art Institute of Chicago, as well as, the Newberry Library.